Enjoy live music, dancing and history at the 5th Annual History Day at Deno's Wonder Wheel Park, Coney Island's oldest amusement park, and the Coney Island History Project exhibit center. 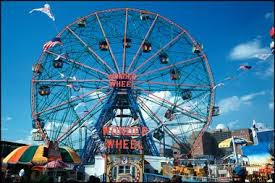 This year's festivities are a celebration of the 95th anniversary of the 1920 landmark Deno's Wonder Wheel and the 60th anniversary of the 1955 Spook-A-Rama, Coney's last classic dark ride. The free event will be held from 1 to 6pm on Saturday, August 8. The rain date is August 9. On History Day, pick up a schedule and souvenir map of the historic attractions in Deno's Wonder Wheel Park at locations throughout the park and at the Coney Island History Project. See our Stilt Walker for a 95th Anniversary Balloon!